No good pictures of the super harvest moon tonight, which was a bit of a letdown. And even better, by the first bald eagle I’ve ever seen in the wild, that wasn’t in a wildlife refuge – just outside the neighborhood. There’s real funny, and there’s just funny, and questionably funny, and lastly my own funny, and my own crazy jokes are joy – at least to me, and that’s what it’s all about. So… after a little more than a year with my first digital SLR – I decided the take the plunge and go from a camera that was just beyond my ability to one that is WAY beyond my ability. Hopefully I’ll give this one a bit more time to catch up to it. There were a lot of reasons I went from the D80 to the D300, most of centers on being able to take continuous pictures faster. I take a lot of pictures of the dogs – and a lot of pictures of my wife’s horse jumping (she’s an eventer) – and I wanted something that would focus better, take more continuous frames, and did better at higher ISOs. I’m pretty happy with all of that so far (and the D300 meters in tough situations a lot better). One thing though, that I have been more than a bit mystified by though is the noise at ISO 800. Everyone review I read about the D300 was that the noise difference (vs. the D200, D80, and others) was spectacular. I can see a difference – but it’s a lot less pronounced than the reviews seemed to make it out to be. And the jury’s still out on this, but I’m not all that sure that what I’m seeing isn’t due to Adobe Lightroom (which is my raw processor and image organization tool of choice). And decided to spend some time in all the raw processors and see how they handled the noise. Profiled is Lightroom (Adobe Camera Raw 4.4), Aperture (Trial Version), Capture NX 1.3 (License included with D300), and iPhoto. I didn’t do ACR+Bridge+PS3, ACR and Lightroom are from my understanding, the same. For the record, Capture NX has a “Faster” or “Better Quality” setting. The differences for this image were really to subtle to include. iPhoto’s default seems a lot like Aperture. Now – what about some adjustments? I really didn’t spend much time playing with Capture NX, one, because it’s incredibly slow to preview anything (which may be cause of Leopard, I don’t know), and two, doing anything seems to radically change things (moving the slider all the way really changes the image). So here’s Lightroom, and Aperture cranked up. In case you are wondering about the “No Noise Reduction” case, here’s Lightroom, and Capture NX (turning off NR for Aperture didn’t appear to do anything for me, so it looks like some kind of default NR is always applied). 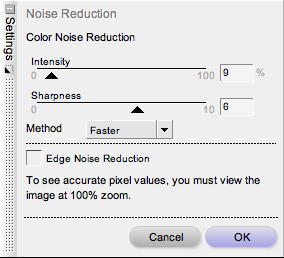 Noise reduction, like beauty, is probably all in the eye of the beholder. But my eye really prefers how Capture NX handles the noise by default. I know that Lightroom is trying to preserve edge detail, and it’s a “different” kind of NR – but I think that the default leaves a bit to be desired compared to the defaults for both Capture NX and Aperture. Cranked up, it’s hard to say. It’s good, but I’d still leave the edge to Aperture here – and certainly Capture is powerful (too powerful) – and iPhoto leaves all semblance of subtlety behind with it’s modifications. I’m still a bigger fan of how Lightroom handles my photo library. (though I haven’t given the Aperture trial a full and fair shake with Library handling). Although I despise how Aperture handles zooming, I really like Lightroom’s handling here. Capture NX, is well, just weird. I’d only see myself using it when there’s an image that I really, really like and want to see if it will do things with it that the others can’t. This is a really interesting software space right now, everything’s different, and good in it’s on way. It will be fascinating to keep watching these packages battle it out in the future. It’s no Mother Theresa in a sticky bun or anything – but hey – you take what you can get. The brown-eyed girl and I managed to get out for a walk along the trails at Yates Mill County Park today. Set the correct time on your cameras. Which I unfortunately failed to do for a bunch of pictures taken today. But chalk one up for yet more things I don’t understand – my D80 knows about time zones and DST – why the heck doesn’t it automatically change? I took the training wheels off my Nikon D80 yesterday. You see, I’m a graduate of the point and shoot camera. I’ve had decent P&S digitals to this point, and my entire photographic way of being has consisted of having a sometimes decent eye for composition, and hoping that the camera would get everything else correct. I’ve spent my photographic life in “Automatic” mode. Most of the pictures I’ve taken to date with the D80 have all been in ‘P’ mode – which is just ‘A’ mode with choices. To this point, I’ve had the camera auto choose focus areas (I felt like a complete dummy when I realized I had a dyamic and single point AutoFocus option and yes, I could actually pick my focus area), and had it largely choose all my shutter speeds and apertures. Even when I was using shutter-priority or aperture-priority modes – I still had the camera in auto-iso. Well, I’ve been going through Bryan Peterson’s Understanding Exposure and I decided it was time to take the training wheels off. Go to manual mode, pick my aperture, pick my shutter, set my iso speed, pick my focus area. And that one not even that much. I know the end result is going to be better one day, but for now it’s like moving on to legion baseball and having to undo every bad habit you learned in little league. I was dial-turning and button-pushin until the cows came home.